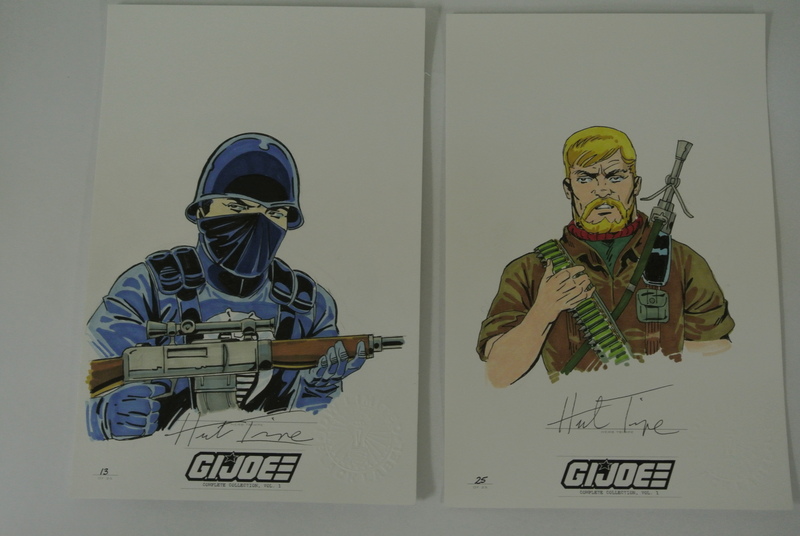 EXCLUSIVE Interview with IDW Limited and EXCLUSIVE Sneak Peek at Upcoming GI JOE Limited Offerings!!!!! Recently I was invited to the top secret headquarters of IDW Limited by Nate Murray, the marketing and community manager and Jerry Bennington, the director of e-commerce sales. They invited me down to the office for a Q & A and a sneak peek at IDW Limited’s upcoming G.I. Joe offerings! IDW Limited was created about a year ago. IDW was looking for an opportunity to expand, specifically with a department that had the specific goal of identifying limited/high end items and bringing them to the fans. With that goal in mind, IDW Limited created a new sub-series of comics by IDW, with three levels of increasingly limited edition high-end releases. These are more than just books, each release contains exclusive content, including original art! The three levels Red, Black, and Blue have a Johnnie Walker feel, with Blue being the most limited. IDW Limited kicked off with TNMNT Red, Black and Blue editions this past January. Then IDW followed that up with Transformers and Judge Dredd. The books have been incredibly successful so far, as the Blue Label editions sell out within 24-hours of each offering. These books are made to be collectible, there is no marketing and advertising creating clutter, the focus is on the art. Each book has a vellum overlay on the title page. The Red Labels are generally limited to 275 copies, hand-numbered and signed. They are presented in a custom-designed slipcase. While the Black and Blue Labels are generally limited to between 10 and 25 copies. Each of these is presented in a custom designed tray case and include hand-drawn, limited edition art! Now that we have a general background on what IDW Limited is and what they produce, I’ll turn the focus to the reason for my visit, IDW Limited’s upcoming GI Joe releases! IDW Limited has mapped out the first three volumes of G.I. Joe, the Complete Collection. This is a collection of the full run of the original Real American Hero, Special Missions, and Yearbook comics, placed in proper reading order and collected in an amazing burlap hardcover volumes. These offerings will include art from the “classic” Joe artists, such as Larry Hama ,Herb Trimpe, and Russ Heath! I was able to see ALL of the art that Trimpe made for the Black edition, and I am speechless! He did a fantastic job with the art, he gave them a great vintage feel and he did amazing work with the colors! I WISH I could afford to buy more than 1! Limited Cover on left, regular edition right. Volume 1 will feature a Red and Black edition. 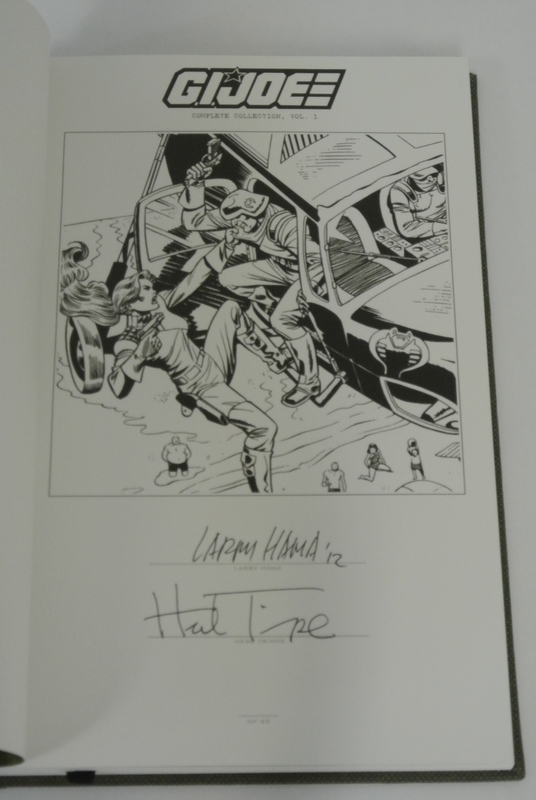 The Black edition is limited to just 25 sets and EACH set will include a hand-drawn and colored piece by Herb Trimpe! You can see from the pictures how well he did! Herb Trimpe was given a character list and allowed to create and interpret those characters. While I saw and know every piece, I will only reveal a few! The characters, just to name a few, include: the Russians (yes the Oktober Guard made it! And they look amazing! ), Gung Ho, Scarlett, Hawk, Snake Eyes, Cobra Commander, and Baroness! This set will be announced for sale next month, and I can’t wait to preorder a copy for myself! 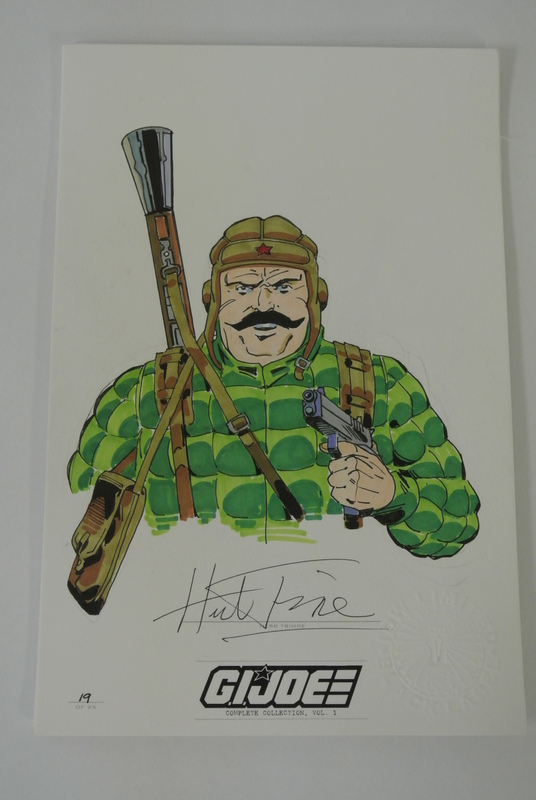 Volume 2 will feature Red, Black and Blue Label editions signed Larry Hama and Russ Heath. The Red edition with have Heath, Black will include a pen and ink character by Heath, and Blue will feature a Russ Heath water color painting! Volume 3 will be signed by Hama and include Black and Blue editions! Both editions will have original sketches by Hama similar in style to the retail incentive covers for IDW’s ARAH, but the Blue Label (15 sets) will be inked a colored by an industry artist, so they will be FULLY finished! IDW Limited’s plan is to eventually start releasing a volume once every quarter, with ongoing volumes and special one-offs. In addition, they are looking into more avenues to present limited releases at all price points. Such offerings may include portfolios, sketch cards and dog tags. G.I. Joe also may provide unique packaging potential like ammo crates, but those are still ideas at this point. Cobra Last Laugh is also planned for release as Black and Blue Label editions in May, signed by Costa and Fuso! Limited will also being to release the IDW Collection of G.I. Joe books as ongoing volumes similar to the Complete Collection that will be released next month. Those books will also include Red, Black and Blue editions. One unique aspect of the IDW Collection books is that they will be sold by character, not artist like the Complete Collection. These books will feature art by Robert Atkins and other artists involved with the G.I. Joe books. Atkins will focus on group shots featuring multiple characters for the Blue Label release! 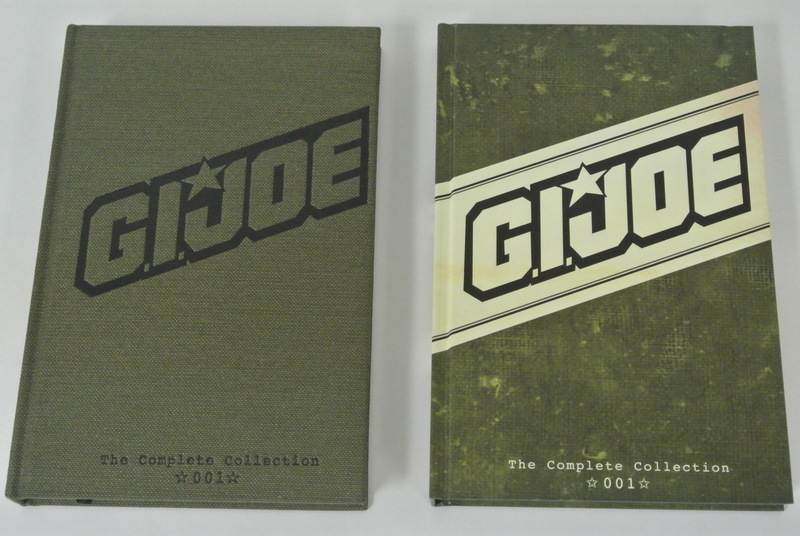 On March 26, IDW Limited will release their first Joe related Limited offering: the G.I. Joe/Danger Girl crossover! These will be signed by Royal and Campbell and be released in Red and Black editions. The hand drawn art included in the Black Label will feature Abby Chase and Abby Chase as Cobra, as well as a cast of characters including the Baroness, Lady Jaye, Zarana and Jinx! Campbell did an amazing job on the art for these! He also added color to several of the pieces, like Zarana’s hair and Jinx’s uniform, as you can see in the pictures! Along with your preorder of this, you will receive Danger Girl Treasury Edition for free! Jinx! Her uniform is shaded in red! Free stuff from my visit! While not Joe related, IDW Limited also announced the My Little Pony Comicfolio. This set is a limited edition keepsake, variant comic cover, the folio, and an exclusive lithograph. While it may not be right up my alley as it all about Ponies, IDW is exploring options for releasing a Joe Comic Folio! The Folios are $25 and are limited to 500 copies. I have to say I am extremely excited for ALL of the upcoming IDW Limited Joe releases! I will definitely be lining up (or pressing F5) to preorder each set as it is announced! The art is incredible and these sets really fill a void in my collection by offering unique hand-drawn art! I also want to thank both Nate and Jerry for taking time out of their day to show me around the offices and let me reveal the amazing art! IDW Limited has put in a ton of time and effort to create unique, one-of-a-kind offerings for comic fans! I also want to thank Nate and Jerry for setting me up with GI Joe Special Missions #1, GI Joe #2, Danger Girl Treasury Edition, and a signed Max Brooks GI Joe Hearts and Minds! I really enjoyed my time there. Categories: IDW Comic Review, IDW Preview | Tags: Cobra, Comic, comics, G.I. Joe, GI Joe, GI Joe Comics, IDW, IDW Comics, IDW Limited, IDW Publishing, Interview, Leaky Suit Brigade | Permalink. Categories: IDW Preview | Tags: Cobra, Comic, comics, G.I. 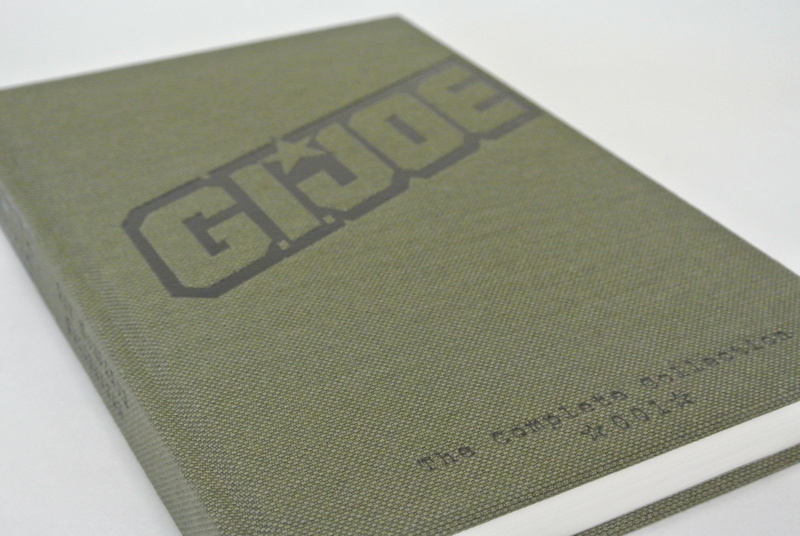 Joe, GI Joe, IDW Comics, IDW Limited, IDW Publishing, Interview, Leaky Suit Brigade | Permalink. Email Interview with Former Hasbro Artist Andrei Koribanics! 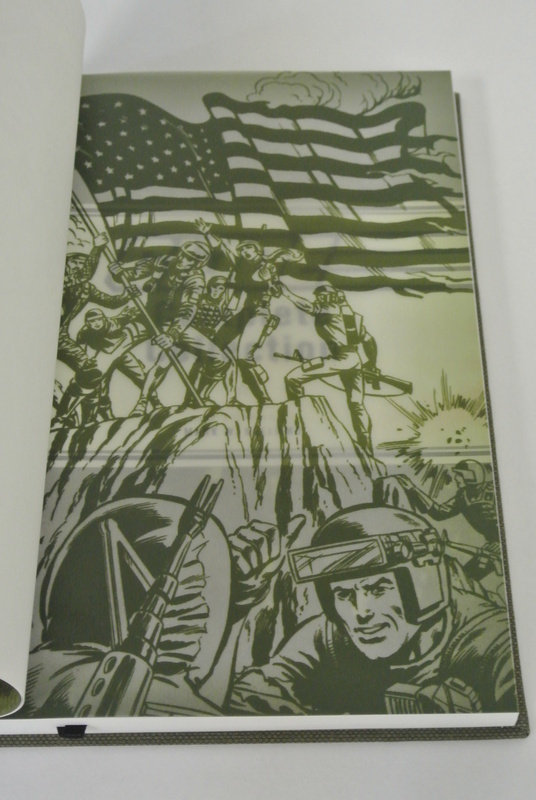 Andrei Koribanics was an artist for Hasbro and he did quite a bit of pre-production artwork for the GI Joe line. He worked on Joe from 1983-1985 and did a number of pencil concept sketches as well as full-blown illustrations (in oil on board) for characters that had “passed the first round” of approvals. He was also behind many of the motorized backpacks. His work was for internal review. Sadly, Hasbro kept all of his work “in-house” so he does not have any mementos of his days with Hasbro. However, there are a few pieces floating around in the wild. -What were you doing before Hasbro? Were you interested in the toy industry prior to working for Hasbro? I was just breaking into the art & design industry when I got the opportunity to work for Hasbro. I’ve ALWAYS loved toys (still do), and, having grown up on the original 12″ Joes (I’m 57 now), it was natural, and very exciting for me. I never made a conscious effort to enter the toy industry… it was pure happenstance that I had the opportunity. -How did you initially start working with Hasbro as a freelancer? How long did you work with them? -Did you work on other lines besides G.I. Joe for Hasbro? -I’ve seen vehicle designs and internal presentation paintings, did you do other kinds of work for G.I. Joe like sculpt inputs (figure turnarounds)? No… that was Bill Merklein’s job. I would never step on a friend’s toes unless he asked me to. -What stage(s) of the design process were you involved in? Mainly early presentation art? Yes, mainly internal presentation art. I would be sent a rough sketch of the character to be depicted, along with a few notes about what to concentrate on and accent (special uniform details, weapons, etc.) I would then create a full-color rendering of the character… I worked in oil paint on illustration board… a bit overkill for the other designers at Hasbro (most renderings were done in marker), but they sold the concepts and I sincerely enjoyed the process. I’m a detail nut by nature, so it was the best medium for me. I DID do a dozen or so concept drawings for additional characters, all in pencil on tissue. I would get no more than a suggestion for a character (e.g. ‘message runner’) and take it from there. I loved the way Hasbro would create an entire ‘story’ about their characters and I did the same thing… again, getting very caught up in details. -Any favorite vehicle or character designs that you remember? I recall ‘Snake Eyes’ very distinctly… also a Bomb Demolition character. I never designed any vehicles, but I did design a series of wind-up motorized backpacks that I am still quite proud of. Either my designs were spot-on, or Hasbro needed to bang them out, but I was thrilled to find them in my local ‘Toys-R-Us’ when they were released, and to see that they stuck to my original designs by about 99%. -Do you own/collect any of the final production pieces that you worked on? I don’t collect Joes myself, though I do see the charm, of course. I prefer model-building, so collect kits like there’s no tomorrow (mostly aircraft). I still sculpt and paint smaller-scale figures for my own pleasure, and enjoy collecting more realistic 1/6 (12″) figures these days. I am not as much into nostalgia as I am into realism. Categories: General Joe Stuff | Tags: Cobra, G.I. Joe, GI Joe, Interview, Leaky Suit Brigade, prototype, Prototypes | Permalink.